There are many of you who have been following us on our journey as we deal with our daughter’s severe eczema over the years. There have been many ups and downs; times filled with a seemingly never ending despair and other times where we see the silver lining that is hidden behind the dark clouds. We have many nights of sleeplessness, days and nights filled with endless itching and bouts of crying when it gets too much sometimes. There is also THE question which comes up once in a while, “Why me?” I have no real answer to her question which would satisfy her need to know. Through all these times we have experienced many precious moments filled with small pleasures, much love and loads of fun. We have learned how to appreciate all that we have by focussing on all the good things in our life rather than all that we do not have. This helps to put things in perspective and never fails to bring a smile to our faces. We have also learned to accept that our life and our daily routine is usually quite different from others and we have made peace with it. We simply have different requirements than most other families when we travel, eat out and socialise amongst other things. We have come to realise over a period of time that this is our new “normal”. Whatever normal family life we had envisioned for ourselves when we had our first child fell by the way side when our daughter’s eczema became a huge part of our lives. We have simply changed the definition of leading a “normal” life and now use one which works for us! Our life has thus changed drastically over the past few years in terms of lifestyle, food habits and priorities. I have been sharing these changes with you through my blog for almost two years now. In this post, I have shared the actual changes that we have made to our food habits over the past 9 months or so. I had mentioned in my post last month (https://eczema-anindianperspective.com/2015/04/08/you-are-what-you-eat-eczema-and-food/) that I would write about her diet in details in my next post and here I am! It has been roughly about 6 months since I started to follow a very specific diet to control my daughter’s eczema based on the book “The Eczema Diet” by an Australian nutritionist, Ms Karen Fischer. The initial 3 months have been the toughest so far with restrictions on the number of fruits, vegetables and spices amongst other things. I did however prepare her mentally over a period of time prior to starting her on the diet to make this transition as smooth as possible. This is a huge change in lifestyle since food comprises a big part of our lives and this change needs to be handled well especially for a child. Once my daughter understood why we were making these changes and how it had benefited others like her suffering from eczema, she became a willing participant. These restrictions are to repair my daughter’s system from within by restricting the intake of the various naturally occurring chemicals (salicylates, sulphites and MSG), allergens, anti nutrients and restore acid alkaline content in the body. Eczema unfriendly food groups like ,wheat, dairy, eggs, sugar etc were all removed even though initially I did give her low gluten foods like spelt flour, rye and barley (no wheat). Eventually over the past few months her diet has been gluten and dairy free, she mostly has organic grains and produce, no refined sugars are added (only much less acid producing maple syrup and golden syrup in low quantities is allowed) and mostly free of preservative/chemical/colouring free (the only exception is the occasional rice pasta). Simultaneously the acid-alkaline balance in her body is being restored through a higher intake of alkalising foods like moong bean sprouts, celery, beetroot, carrots etc on a daily basis and taking only those acid-forming foods like legumes/wholegrains/chicken etc which are good for skin or are nutritious in other ways. Restoring this acid-alkaline balance is very important because our diets nowadays tend to be filled with mostly acid forming with foods like bread (containing yeast); sugar in processed foods like breakfast cereals, bakery items apart from beverages (fruit juices, sodas etc); corn and corn based foods; cheese just to name a few. While going to an extremely alkaline diet is not recommended, our body needs a healthy and balanced diet to maintain healthy kidney function and prevent weakened bones, muscle wasting and of course the itchiness which is prevalent in those with eczema. Phase I– The phase I recipes were very basic and initially I followed most of the recipes given in the book. But I had to adapt some of the recipes a bit to suit our Indian taste and add a few of my own in order to ensure that I could give her some variety even with all the restrictions. She was allowed only garlic and parsley as far as spices and herbs were concerned which proved to be the toughest part about following the diet since Indian food is filled with all kinds of spices. The other difficult part was cutting out all (100%) processed foods and eating only homemade food. Some of the foods that my daughter enjoyed in the first phase were baked fish (pomfret) with garlic in white sauce made of soy milk and brown rice flour; baked chicken in garlic and in a similar sauce; mutton/chicken biryani (or lightly flavoured mutton/chicken in a kind of rice pilaf) with only garlic and broth as the main flavour. While initially it was difficult for her to forego a lot of her favourite foods (pizza, Maggi noodles, baked items like doughnuts, cupcakes, biscuits and candies to name just a few), over a period of time she has accepted it as a way of life and has made peace with it. In response, her skin condition improved visibly and her itching reduced to an extent. But I should also mention here that since she was started on a new immunosuppressive medication (Methotrexate), the changes would be due to both her medication and diet. But while medication would have helped to suppress and control her eczema, her skin tone has gone back to what it was 2 years back and all the weight that she had put on due to oral steroids simply fell off. I attribute these two significant changes to the changes in her diet. Phase II – The second phase has been much easier to follow as compared to phase I. Also the fact that I have honed my skills as a baker and chef has helped immensely. I can honestly vouch for the fact that necessity is the mother of invention! All the restrictions that circumstances have placed upon my daughter and as a result on our family have helped me to innovate and become a better cook/baker than I would possibly have ever been otherwise. Our family is eating a larger variety of healthy foods than ever before with minimal processed foods (so bye-bye preservatives, sugar, chemicals, refined and simple carbohydrates, junk foods) and loads of heart healthy, skin friendly fruits, vegetables and protein (mostly fish and chicken) with natural/organic ingredients. The fallout of all this is that both my husband and I have shed some of our excess weight naturally as a result of incorporating green and healthy juices/smoothies, healthy snacks etc into our own diet. SInce I had to restrict my daughter’s diet to ones with very specific ingredients, I started making a lot of the desserts/foods like crackers, cookies, doughnuts, cakes etc with eczema safe ingredients at home. Over the last 6 months I have added a lot of variety in terms of foods like jowar, brown rice and brown rice flour, flour, quinoa, sweet potato, sprouts (all kinds), vegetable juices and smoothies. Quite a few of these changes have been for the entire family. You can be as creative as you want but the key thing here is to plan ahead. Also, keep in mind that eating healthy does not mean eating only a few foods and having dull or unappetizing foods. Since I have been forced to look outside my comfort zone of eating/preparing the same foods all these years, it has actually opened my eyes to the amazing variety and richness of foods that is available to everyone if one knows where to look. The availability of different varieties of foods (quinoa, gluten free flours, golden syrup, organic produce, kinds of microgreens and salads, gluten free milk like almond and soya to name a few) both offline through Godrej Nature’s Basket and Foodhall stores in Mumbai and online (gourmetco.in, foodesto.com, naturallyyours.in) have really helped us a lot. As our daughter now says, she is not following any particular diet as of now but simply eating “healthy”.This is true not only for her but for the entire family. Of course it is not always very simple or easy to eat healthy especially while travelling or eating out even though our daughter’s eating out now is extremely restricted for obvious reasons. But now I realise that after more than 9 months of changing our food habits at home, my husband and I tend to think twice before we order the next cake, sugary drink or buy a packaged food. What started off as a necessity to manage our daughter’s eczema has become a habit for us. It became easier for us to accept and change our food habits once we realised the critical importance of diet in managing chronic illnesses like eczema (I have written about this in my earlier post- https://eczema-anindianperspective.com/2015/04/08/you-are-what-you-eat-eczema-and-food/). Also, even though I have expanded her diet and modified it to suit our Indian tastes over a period of time, the book “The Eczema Diet” is what first made me consider food and diet as a tool for managing eczema. I have now come across and follow various other blogs and websites which are dedicated to managing various kinds of chronic conditions through food and dietary changes, reduction in stress levels, yoga and other forms of mind- body excercise etc. As mentioned in my post (https://eczema-anindianperspective.com/2015/04/08/you-are-what-you-eat-eczema-and-food/) we will be getting some tests done in London with the help of a Functional Medicine practitioner for “gut health” permeability. 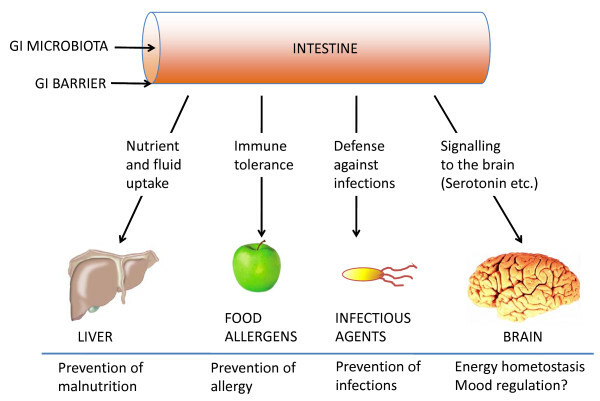 Gut health is determined by a healthy variety and a community of about 100 trillion microbial cells in our digestive tract and impacts our physiological, nutritional, metabolic well-being including our immune system. It is now considered to be one of the leading causes of all kinds of chronic illnesses like coeliac disease, irritable bowel syndrome, eczema (now considered to be an auto immune disease), Graves disease, Hashimotos just to name a few and it’s importance is best explained by the image below. I will be wrtiting more on these once we get tests done next month and have more clarity on the same. You can do your own research on this and use this knowledge to make an informed decision about the making food and diet an important part of the treatment for your child or anyone suffering from autoimmune disorders/chronic conditions. And so it is with us. Our journey is long and is filled with twists and turns and Atopic Dermatitis seems to be our constant travelling companion whether we like it or not. So over a period of time, we have learned to gracefully accept these circumstances to make our journey more comfortable and even memorable. This is true even though all the while we are constantly trying to manage our daughter’s eczema in ways which are less harmful to her in the long run. Whether we realise it or not, sometimes it is the journey which teaches us a lot about our destination…. This entry was posted in Diet, Eczema, History, Living with eczema and tagged Atopic dermatitis, autoimmune, chronic, Conditions and Diseases, coping, eczema and diet, Functional Medicine, Gluten-free diet, gut health, living with eczema. Bookmark the permalink.